Check out this home rehab job we completed in Dover NH. 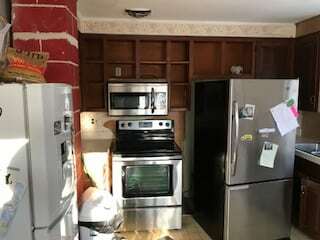 These images are of the kitchen and show the before and after shots. Check out the white cabinetry with those steel appliances! The trim around the kitchen was changed up as well as the trim around the window. Also, hardwood floors were installed. We took apart everything and rebuilt it! It’s what we do. Making your kitchen dreams come true! Throughout the time you spend living in your home, you begin wondering all of the what-ifs. What if we had hardwood floors? What if we knocked down that wall? What if our kitchen cabinets were different? We love working with our clients on all of the changes that can happen with your home! We specialize in home repair and home rehab projects. 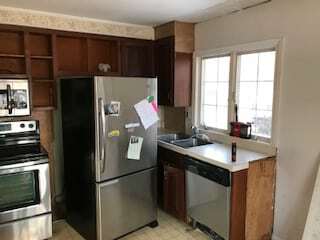 Ready for some kitchen or home rehab? We all love watching shows where homes are flipped, and we bet you wish you can do it to your home too! Great news. We live for this. We are a fairly priced home rehab and repair company ready to tack homes on the Seacoast. We want you to enjoy your living space. Give us a call today or contact us below!